Alphasense, established supplier of electrochemical gas sensors, also offers 4-20 transmitter boards to measure toxic gas, carbon dioxide and oxygen concentrations for use in fixed installation systems. The 4-20mA digital boards can be used with all Alphasense toxic gas sensors whilst the analogue boards are suitable for most Alphasense oxygen sensors and unbiased B series toxic gas sensors. Both boards have the same dimensions, pillar locations, 2-wire current loop connectors and 4-20 mA output. The 4-20 mA current is linear from 0 ppm (4 mA) to your specified full scale concentration (20 mA). The voltage measured across a resistor in series with the supply current (typically 100 ohms load resistor) will give an accurate measurement of gas concentration. The boards supplied with sensors are pre-calibrated to customer requirements. The 4-20 mA output signal provides an equivalent performance to that shown in the individual sensor Technical Data Sheets, but scaled to your specific range requirements. 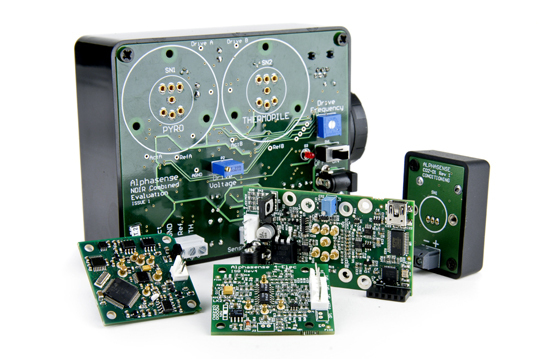 Alphasense NDIR transmitter boards offer both 4-20 mA and USB outputs, scaled to one of four ranges. Concentration range can be recalibrated via PC/ USB port using our proprietary software. To allow OEMs to distinguish their product from other offerings, the sensor-to-gas aperture design is left for the OEM to execute.